Dogs are a social species who can say a lot about how they feel and their intentions with body language. While it is quite intuitive to spot when your dog is happy, some of the other postures can be subtler. Pet specialists James Wellbeloved explain that by understanding your dog’s body language, you can learn what situations most often cause him or her to feel stressed or excited. With this information, you can better anticipate stressful situations and keep your dog happy and calm. Few things make a dog owner happier than seeing their pet wag their tail with excitement. This movement, along with relaxed eyes and lips, and with lots of licking and nudging, is a clear sign of a happy and playful dog. A lesser known sign of affection is for dogs to simply sit and stare at their owner. This is because they form a close bond with us and long to hear our voice or engage in play; by sitting and staring, they are telling you that they want to engage with you. On the opposite end of the scale, a dog who avoids eye contact with someone or something, but for peering out of the corner of their eye, is communicating that they feel anxious. Nervous or afraid dogs will hunch their body, with their weight on their back legs in case they can make a quick getaway, will flatten their ears and will yawn or lick their lips. 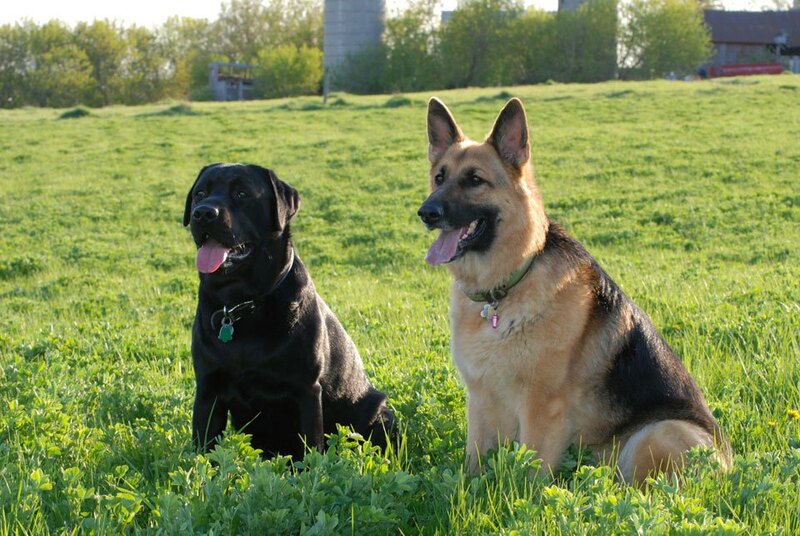 Anxiety often leads to aggressiveness if your dog feels cornered or threatened. Much of the body language is the same—flattened ears, rigid muscles and tail between the legs—but your dog may also start to growl and pull their lips back to show their teeth. The reason the body language is so similar is because most aggressive behaviours are last resorts for dogs; they actually feel scared by unable to escape, so feel the only way to defend themselves is to fight. More often than not, aggressiveness is just an extreme form of anxiety. Dominance is not the same as aggression, though some of the signs appear similar at first. Raised fur, rigid muscles and a soft growl. However, dominant body postures are also ones of confidence: direct eye contact; a wagging tail; and a strong pose. Being dominant doesn’t necessarily lead to aggressiveness. Instead, it is just a dog’s way of saying he or she is the boss. Likewise, dogs also display submissive behaviour as a way of appeasing one another. Dogs that might be dominant in their own home are more willing to be submissive in public spaces or the homes of other dogs. However, being submissive doesn’t mean being unfriendly. Often, while submissive dogs will get low to the ground or hunch over and tuck their tail between their legs, they will also attempt to nuzzle the dominant dog. Only if the submissive dog licks his or her lips and avoids eye contact (the signs of anxiety) are they feeling afraid.